The 86th 24 Hours of Le Mans (French: 86e 24 Heures du Mans) was an automobile endurance event that took place on 16 and 17 June 2018, at the Circuit de la Sarthe, Le Mans, France. It was the 86th running of the 24 Hour race organised by the Automobile Club de l'Ouest, and the second round of the 2018–19 FIA World Endurance Championship. The race was won by the No. 8 Toyota Gazoo Racing driven by Fernando Alonso, Kazuki Nakajima, and Sébastien Buemi, who also started from pole position. Toyota entered the only hybrid LMP1 cars and dominated the race weekend. The LMP2 class was won by Signatech Alpine, after G-Drive TDS Racing finished first but were subsequently disqualified. The LMGTE Professional class was won by Porsche GT Team, whilst Dempsey-Proton Racing were class winners in LMGTE Amateur. During the winter following the 2017 24 Hours of Le Mans, modifications were made to the Porsche Curves section of the Circuit de la Sarthe to increase safety. Barriers on the inside of the final right-hand corner were dismantled and relocated further away from the circuit, allowing for the construction of paved run-off area and escape roads. This same alteration had been done on the barriers outside the corner the previous year. This modification re-profiled the corner slightly, shortening the lap distance by 3 metres (9.8 ft). The ACO also constructed a new starting line gantry 145 metres (476 ft) further up the main straight to allow more cars on the straight at the start of the race. The finish line and all timing beacons however remain at the previous starting line at the exit of the Ford Chicane. Automatic entry invitations are earned by teams that won their class in the previous running of the 24 Hours of Le Mans, or won championships in the European Le Mans Series, Asian Le Mans Series, and the Michelin GT3 Le Mans Cup. The second-place finisher in the European Le Mans Series LMGTE championship also earns an automatic invitation. Two participants from the WeatherTech SportsCar Championship are chosen by the series to be automatic entries by the ACO regardless of their performance or category. As invitations are granted to teams, they were allowed to change their cars from the previous year to the next, but not allowed to change their category. The LMGTE class invitations from the European and Asian Le Mans Series are allowed to choose between the Pro and Am categories. European Le Mans Series' LMP3 champion is required to field an entry in LMP2 while the Asian Le Mans Series LMP3 champion may choose between LMP2 or LMGTE Am. The Michelin Le Mans Cup LMP3 champion does not receive an automatic entry and the GT3 champion is limited to the LMGTE Am category. The initial entry list was announced, along with the FIA World Endurance Championship and European Le Mans Series entries, on 9 February. Coming into the race, Toyota was the heavy favorite for the overall victory due to its hybrid power capabilities in the LMP1 category, amongst its mostly new non-hybrid/privateer rival teams of Rebellion Racing, SMP Racing, DragonSpeed, ByKolles Racing Team, and CEFC TRSM Racing. The recent departure of Porsche from the LMP1 category in 2017 and Audi in 2016, Toyota was the only hybrid prototype, for the 2018–19 FIA World Endurance Championship. Consequently, this merged the hybrids and non-hybrids/privateers together in the LMP1 class. The race featured the debut of Ginetta's chassis raced by CEFC TRSM Racing with a Mecachrome engine. It joined the Rebellion R13, raced by Rebellion Racing, BR Engineering BR1, raced by SMP Racing and DragonSpeed (making their debut in LMP1), and the CLM P1/01, raced by ByKolles Racing. Fernando Alonso also made his first 24 Hours of Le Mans race start, racing with Toyota. Toyota led throughout all the test, practice, and qualifying sessions. Its time in qualifying of a 3:15.377 was good enough to place first on the grid, well ahead of the other cars in its class. Its sister car took 2nd overall followed by Rebellion Racing on the grid. LMP2 was the biggest class in the race with 20 entries, IDEC Sport claimed the top spot after claiming the fastest time in qualifying of a 3:24.842 and 10th overall followed closely behind by the DragonSpeed, G-Drive Racing, and TDS Racing, all in Oreca 07's in 11th, 12th, and 13th places overall off the grid. Jackie Chan DC Racing, last year's LMP2 winner started 15th in class, 26th overall starting position. In LMGTE both classes were mainly controlled by Porsche. LMGTE Pro was led by the Porsche GT Team with 3:42.504 and 31st overall, with another one of its sister cars in second off the grid in the class and 32nd overall. Ford Chip Ganassi Team UK and AF Corse where 3rd, 33rd overall and 4th, 34th overall respectively to start the race. The new BMW M8 GTE was deployed and raced by BMW Team MTEK made its Le Mans debut and started off the grid 12th in class, 42nd overall. The sister car started behind it in 43rd overall. Dempsey-Proton was able to qualify top in the LMGTE Am class, with a time of 3:50.728 and placed 44th overall, ahead of the second of the LMGTE Pro entries of Corvette and Ferrari. Gulf Racing UK and the sister Dempsey-Proton car rounded out the top 3 in LMGTE Am on the grid. ^ a b The No. 33 DC Racing Ligier and No. 48 IDEC Oreca had their fastest lap time deleted for failing to slow to 80 km/h in a Slow Zone. ^ a b c The No. 28 TDS Oreca, No. 44 Eurasia Ligier, and No. 6 TRSM Ginetta-Mechachrome had several lap times deleted for failing to stop for a mandatory weight check. These included their fastest times of the session. The race began at 15:00 Central European Summer Time, with tennis champion Rafael Nadal waving the French tricolour at the starting line. Sébastien Buemi led the field from pole position in the No. 8 Toyota. As had been widely predicted, the two hybrid Toyota cars dominated the race.In. the Dunlop Chicane, after contact with Buemi, Lotterer spun after more contact with Ben Hanley's DragonSpeed. Lotterer pitted immediately, and, from 7th in class, Jeroen Bleekemolen dropped his LMGTE AM Ferrari coming into the Porsche Curves. 3 1/2 hours in, Gabriel Aubry's left front tire failed in the esses, then blew violently at slow speed, and delaminated. The safety car was deployed for a quarter of an hour, then, four hours in, Dominik Kraihamer attempted to go around the outside of the No. 80 Porsche in Karting Curve, and made contact, throwing the car into the outside barrier in the following Corvette Curve. The safety car was out for half an hour, before the field went racing again. 6 1/2 hours in, the Porsche of Dumas had a suspension failure, eventually retiring, while a brake failure for Canadian driver Paul Dalla Lana forced the retirement of the third-in-class Aston Martin in LMGTE AM. Kobayashi lost the lead after a mistake in the Porsche Curves, allowing compatriot Nakajima to take the lead in the sister Toyota. In the ninth hour, Matevos Isaakyan lost control in the Porsche curves after a suspension failure. He later retired with an electric failure that discontinued its third place overall. Not long after, Turvey had an electrical failure in the esses and stopped at Tertre Rouge. Eng had a damper failure and fell to 13th in class. In the morning, Senargiotto went off at Indianapolis and had an accident, but was able to recover. Alexander Sims, in the second BMW, went straight on in the Porsche Curves and ping-ponged off the inside barrier. He retired because of damage. Cairoli had a suspension failure and hit the wall in the Ford Chicanes. Hanley spun in the Porsche Curves, eventually retiring. The No. 28 spun near the crash site of Cairoli, and then, a safety car was deployed after damage to a kerb. The repair took half an hour, and, just shortly after the field went green, Romano Ricci spun in the Porsche Curves. Paul di Resta overcorrected an oversteer in the same corner that Ricci spun in, and hit a concrete barrier straight-on. The safety car came out again for the crash. Kobayashi missed a stop, then Euan Hankey encountered a driveshaft issue and spun in the Porsche Curves. Jenson Button had an engine failure in the final hour, and Fernando Alonso, Sebastien Buemi, and Kazuki Nakajima won two laps up from Kamui Kobayashi, Jose Maria Lopez, and Michael (known as Mike) Conway. The lead swapped between the Toyotas several times over the first half of the race, before the #8 car was assessed a 60-second penalty when Buemi exceeded the speed limit in a caution zone during the night. This put the #7 car over two minutes ahead, a lead they maintained until Fernando Alonso closed the gap during a quadruple stint in the dark. After 16 hours, Kazuki Nakajima took the #8 car into the lead, which they maintained for the rest of the race. During the final hour, Kamui Kobayashi in the #7 Toyota missed a pit stop, forcing him to complete most of a lap on electrical batteries alone when he ran out of fuel. The car made it back to the pits on the next lap, allowing Toyota to complete a one-two finish, ending with the #8 car two laps ahead of the #7 car. Toyota were the second Japanese manufacturer to win at the 24 Hours of Le Mans, following Mazda's triumph in 1991. Fernando Alonso, Sébastien Buemi, and Kazuki Nakajima all earned their first wins. Buemi and Nakajima had come close at the 2016 race, when their car broke down whilst leading on the final lap. Alonso's win meant he had completed two of the three legs of the Triple Crown of Motorsport. In the LMP2 class, G-Drive TDS Racing finished two laps ahead of their competitors, but were subsequently disqualified when it was discovered that they had made illegal modifications to their pit lane refuelling equipment. Signatech Alpine were therefore promoted to LMP2 class winners. The LMGTE Professional class was won by Porsche GT Team, whilst Dempsey-Proton Racing were class winners in LMGTE Amateur. The minimum number of laps for classification (70% of the overall winning car's race distance) was 272 laps. Class winners are in bold. ^ The No. 67 Ford was penalised 11 laps and 1:23.499 by the stewards following the race because Tony Kanaan did not meet the minimum overall drive time of six hours. ^ The No. 69 Ford was penalised 2 laps and 1:42.968 by the stewards following the race because Scott Dixon did not meet the minimum overall drive time of six hours. ^ The No. 5 Ginetta was penalised 6 laps and 2:45.613 by the stewards following the race because Léo Roussel did not meet the minimum overall drive time of six hours. ^ The No. 44 Eurasia Ligier was not classified as a finisher for failing to complete the final lap of the race. ^ a b The No. 26 G-Drive and No. 28 TDS Orecas, both under the operation of TDS Racing, were disqualified from the race after it was found that the team had illegally modified their refueling equipment in order to fuel both cars quicker than regulations allowed. ^ Prior to the disqualification, the No. 28 TDS Oreca was penalised 1 lap and 1:18.188 by the stewards following the race because driver François Perrodo exceeded his maximum drive time of four hours within a six hour period. Note: Only the top five positions are included for Drivers' Championship standings. ^ "The FIA World Motor Sport Council approves the dates for the 2018 24 Hours of Le Mans | ACO – Automobile Club de l'Ouest". Lemans.org. 2017-06-19. Retrieved 2017-07-17. ^ a b c Klein, Jamie. "G-Drive team loses Le Mans LMP2 win for illegal device in pitstops". Autosport.com. Retrieved 19 June 2018. ^ "Signatech Alpine confirmed as Le Mans LMP2 winner". RACER. 2018-10-02. Retrieved 2018-10-05. ^ a b c d e f Richards, Giles (17 June 2018). "Fernando Alonso wins Le Mans 24 Hours to get closer to triple crown". The Guardian. Retrieved 19 June 2018. ^ Davoine, Basile; Watkins, Gary (22 February 2018). "Porsche Curves safety upgrade on Le Mans 24 Hours circuit completed". Autosport.com. Motorsport Network. Retrieved 15 June 2018. ^ "2018 Le Mans 24 Hours – The last teams invited!". ACO. 2018-02-04. Archived from the original on 2018-07-03. Retrieved 2018-07-03. ^ Kilshaw, Jake (9 February 2018). "24H Le Mans Entry List Released". Sportscar365. Retrieved 17 June 2018. ^ "List of the Competitors, Drivers and Cars Eligible to Take Part in the Race" (PDF). Automobile Club de l'Ouest. 16 June 2018. Retrieved 17 June 2018. ^ "FIA WEC 86th Edition des 24 Heures du Mans Qualifying Practice 1 – Final Classification" (PDF). Automobile Club de l'Ouest. 14 June 2018. Archived from the original (PDF) on 2018-06-14. Retrieved 13 June 2018. ^ "FIA WEC 86th Edition des 24 Heures du Mans Qualifying Practice 2 – Final Classification" (PDF). Automobile Club de l'Ouest. 14 June 2018. Archived from the original (PDF) on 2018-06-14. Retrieved 14 June 2018. ^ "FIA WEC 86th Edition des 24 Heures du Mans Qualifying Practice 3 – Final Classification" (PDF). Automobile Club de l'Ouest. 14 June 2018. Archived from the original (PDF) on 2018-06-15. Retrieved 14 June 2018. ^ "Decision No. 20" (PDF). Automobile Club de l'Ouest. 14 June 2018. Retrieved 14 June 2018. ^ "Decision No. 17" (PDF). Automobile Club de l'Ouest. 14 June 2018. Retrieved 14 June 2018. ^ "Decision No. 18" (PDF). Automobile Club de l'Ouest. 14 June 2018. Retrieved 14 June 2018. ^ "Decision No. 23" (PDF). Automobile Club de l'Ouest. 14 June 2018. Retrieved 14 June 2018. ^ Lloyd, David (14 May 2018). "Nadal Announced as Le Mans Starter". Sportscar365. Retrieved 16 June 2018. 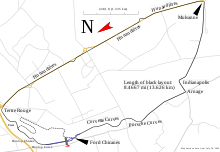 ^ "FIA WEC 86th 24 Heures du Mans Race (1,440') – Provisional Starting Grid" (PDF). Automobile Club de l'Ouest. 15 June 2018. Retrieved 16 June 2018. ^ a b c d e f Benson, Andrew (17 June 2018). "Fernando Alonso wins Le Mans 24 with Toyota". BBC Sport. Retrieved 19 June 2018. ^ Andrew Benson (17 June 2018). "Fernando Alonso wins Le Mans 24 with Toyota". BBC News. Retrieved 17 June 2018. ^ a b "FIA WEC 86th 24 Heures du Mans Race – Provisional Classification" (PDF). Automobile Club de l'Ouest. 17 June 2018. Retrieved 17 June 2018. ^ a b c d Dagys, John (18 June 2018). "No. 67 Ford Loses Fourth in GTE-Pro Due to Drive Time Infraction". Sportscar365. Retrieved 18 June 2018. ^ Klein, Jamie (June 18, 2018). "G-Drive LMP2 squad stripped of Le Mans victory". Motorsport.com. Motorsport Network. Retrieved June 18, 2018. ^ "2018 – 2019 LMP World Endurance Drivers Championship" (PDF). Fédération Internationale de l'Automobile. 17 June 2018. Archived from the original (PDF) on 17 June 2018. Retrieved 18 June 2018. ^ "2018–2019 LMP1 World Endurance Championship" (PDF). Fédération Internationale de l'Automobile. 17 June 2018. Archived from the original (PDF) on 17 June 2018. Retrieved 18 June 2018. ^ "2018 – 2019 World Endurance GTE Drivers Championship" (PDF). Fédération Internationale de l'Automobile. 17 June 2018. Archived from the original (PDF) on 17 June 2018. Retrieved 18 June 2018. ^ "2018–2019 World Endurance GTE Manufacturers Championship" (PDF). Fédération Internationale de l'Automobile. 17 June 2018. Archived from the original (PDF) on 17 June 2018. Retrieved 18 June 2018. Wikimedia Commons has media related to 2018 24 Hours of Le Mans.